Thirteen recommendations promote efficiency and modernization in the state judicial branch. 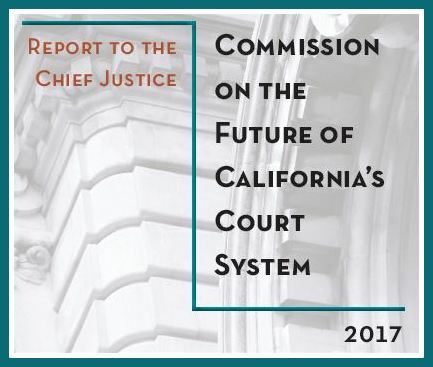 Chief Justice Tani G. Cantil-Sakauye today received the final report of the Commission on the Future of California’s Court System. The 290-page report includes 13 broad recommendations dealing with civil and small claims, criminal and traffic law and procedures, family and juvenile law, fiscal and administrative operations, and technology. The 63-member Futures Commission was co-chaired by Associate Supreme Court Justice Carol A. Corrigan and Administrative Presiding Justice William R. McGuiness of the Court of Appeal, First Appellate District and began its work in July 2014. The Commission’s methodical approach included an initial survey that generated more than 2,000 responses from lawyers, judges, judicial branch professionals, and others. It conducted five public comment sessions, 430 conference calls, and 22 in-person meetings of its various working groups.